Research is accumulating in support of eccentric strengthening exercises to prevent hamstring injury in soccer players, and possibly to screen for athletes at risk, according to several studies presented at the IOC conference in Monaco. Investigators from the Netherlands and the US both found that male soccer players who performed eccentric strengthening exercises were significantly less likely to sustain hamstring injuries than those who did more conventional training. In the Dutch study, 41 teams of male amateur soccer players were randomized to 13 weeks of regular soccer training or training that included 25 sessions of Nordic hamstring exercises (also known as Nordic hamstring lowers). The results presented in Monaco included analysis of 16 teams in the intervention group and 19 teams in the control group. In the nine months following the intervention, there were 19 hamstring injuries in the control group and six in the intervention group, a statistically significant difference that translates to a relative risk of 4.267 for the controls. Number of days missed per injury, however, did not differ significantly between groups, according to Nick van der Horst, MSc, a researcher in the department of rehabilitation at the University Medical Center Utrecht, who presented the findings. In the US, a study of collegiate soccer players found that a significant reduction in hamstring injury risk appears to be a benefit of using the FIFA 11+ warm-up program, which includes eccentric hamstring strengthening. “We’ve got the science. We know the program is working. Now we just have to get people to utilize it,” Silvers said. The Nordic hamstring exercise may also be useful as a screening tool to identify athletes at increased risk for hamstring injury, according to research from Queensland University of Technology in Brisbane, Australia. Of 210 elite Australian football players, those with low levels of eccentric strength during the Nordic hamstring exercises at the start of the preseason were significantly more likely to go on to sustain a hamstring injury. But increasing that strength may be easier said than done, particularly in athletes with a history of hamstring injury, which in itself is a risk factor for future injury. A second study from the Queensland group found that Australian football players with a history of hamstring injury demonstrated significantly less improvement in knee flexor strength than uninjured players following 16 to 18 weeks of training that included Nordic hamstring exercises. Interestingly, the limited improvement in the players with previous hamstring injury was observed in both limbs, not just the previously injured limb, according to Anthony Shield, PhD, a senior lecturer in the School of Exercise and Nutrition Sciences at the university, who presented the findings in Monaco. Van der Horst N, Wouter Smits D, Petersen J, et al. The preventive effect of the Nordic hamstring exercise on hamstring injuries in amateur soccer players: A randomized controlled trial. Br J Sports Med 2014;48(7): 609-610. Silvers H, Mandelbaum B, Bizzini M, Dvorak J. 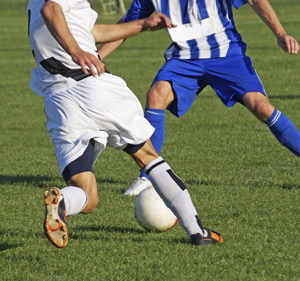 The efficacy of the FIFA 11+ program in the collegiate male soccer player (USA). Br J Sports Med 2014;48(7):662. Opar D, Williams M, Timmins R, et al. Eccentric hamstring strength during the Nordic hamstring exercises is a risk factor for hamstring strain injury in elite Australian football: A prospective cohort study. Br J Sports Med 2014;48(7):647-648. Shield A. Previous hamstring injury reduces pre-season improvements in eccentric strength in elite Australian football players. Br J Sports Med 2014; 48(7):660.